#FirebirdPremiumTalon I recently had the pleasure of trying out Wireless Noise Cancelling Headphones. This is bluetooth technology at it's finest. Background noise is not a problem with these earbuds in.Multiple eargels give a comfortable custom fit for exceptional noise isolation and maximum comfort. 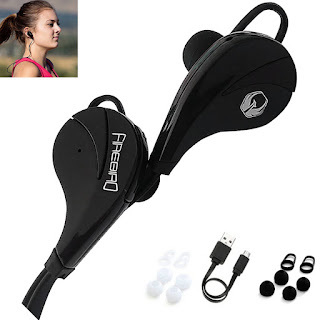 With Bluetooth 4.0 and APT-X these earbuds provide high fidelity stereo music and clear speech. Talon provides HD sound while remaining sweatproof. Has a 30 ft range too so your phone doesn't get sweaty while you workout. The intuitive user interface on the right earbud gives the user complete control of all functions with 2 buttons. You can answer/hangup calls, choose songs, play/pause music, and adjust volume. The rechargeable battery lasts for 5 hours of nonstop use. These headphones hook up easily with your iPad, iPhone,iPod Touch, Android Smartphones, tablets, Bluetooth enabled music players and any device with Bluetooth. You get the headphones, 6 pairs of eargels, charging cable, battery, and a lifetime warranty. You'd have to hear them to know how amazing they are!